This is the OVW Report for Wednesday, July 16, 2014. This episode can be seen online starting tomorrow at www.ovwrestling.com/tv. In this episode, a Fatal 4 Way determines the new #1 contender for the OVW Heavyweight Title, Adam Revolver defends the TV Title against Robbie Walker, Gilbert Corsey interviews Flash Flanagan, plus more! Dapper Dan vs. Randy Terrez. Dan with a wristlock, but Terrez with an arm drag. Terrez with a couple more arm drags and a hip toss before locking in an armbar. Dan throws Terrez off the ropes, but Terrez leaps over Dan and hits a hurricanrana. Dan goes outside. Terrez follows him out and chops him. He rolls Dan in, but Dan gets up and kicks Terrez on his way in. He splashes Terrez in the corner and slams him. He misses an axehandle drop and a charge in the corner. Terrez with a flying fist to the head, and a corkscrew suplex for the 3. Eric Locker vs. Elvis Pridemoore. Eric with an armbar. He elbows Elvis in the back of the head. He locks in another submission before throwing Elvis hard head-first into the turnbuckle. He slams Elvis. He goes for a second slam, but Elvis slides off and chops Locker and hits him with a dropkick. He hits a flying forearm and splashes him across the middle rope. He goes up top, but jumps into a boot. Locker hits an overhead belly-to-back suplex for the 3. "The Congregation" comes out and Rev. Stuart Miles says tonight's good word is 'trinity'. He says one is lonely, two is not enough, but three will conquer. "The Congregation": "The Pastor of Disaster" Rev. Stuart Miles, "Altar Boy" Jade Dawson, & "the Apostle" Jake Glasure vs. "Ram Jam" Jonathan Ramser, J. Best, & Jack Rebel. Best locks in an armbar on Jade. Ram Jam takes over and kicks Jade, before tagging Rebel. Rebel takes over, but is pulled down by Miles from the outside after being thrown into the ropes. Rebel is triple teamed in the corner. Jade misses a splash and Rebel gets the tag to Best as Jade tags Miles. Best with a back elbow, powerslam, and a diamond cutter, but Glasure & Jade break the pin. Rebel & Ram Jam are in, but both get knocked to the outside. Glasure with a side slam, and all 3 members of the Congregation yank Best off the mat and slam him back down. Miles gets the 3. That concludes tonight's pre-show dark matches. I always recommend watching the episode first on TV or online before reading the rest of the report. Again, you can check it out on OVW's official website late Thursday afternoon/evening at www.ovwrestling.com/tv and on WBNA ion-21 in the Louisville area Saturdays at 9AM and 10PM (check local listings). Dean Hill & Gilbert Corsey are on commentary with Shannon the Dude as the ring announcer. 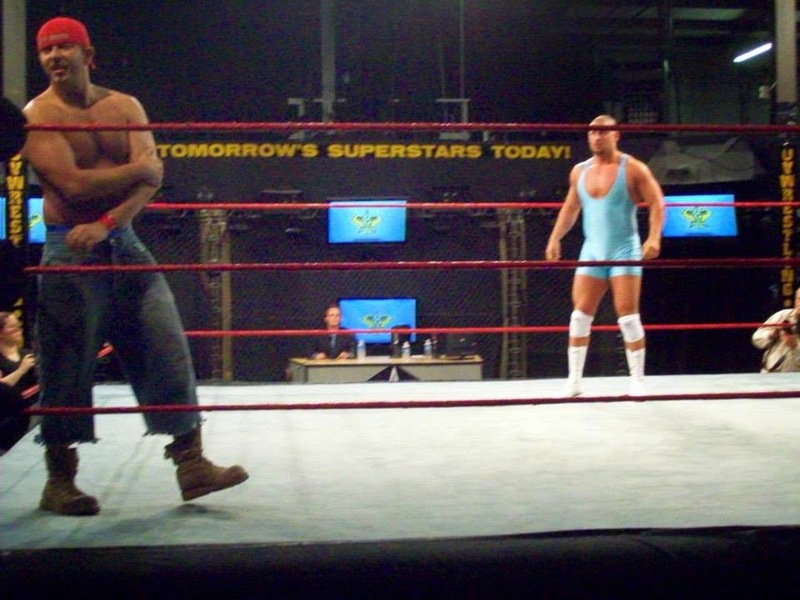 OVW TV TITLE: "Primetime" Robbie Walker vs. Adam Revolver (w/Michael Titus). Jordan Barker is in the ring, but Josh Ashcraft uses his power as Senior Official to take over. He tells Robbie he has to check him for weapons. He makes Robbie turn around, and Adam attacks him from behind. He knocks Robbie to the outside and pounds him on the floor. Back inside, Adam is caught with a dropkick. Robbie kicks him in the gut and hits a flying clothesline off the ropes. He hits a missile dropkick off the top rope, but Josh has something in his eye. Adam tries to roll Robbie up from behind, but Robbie rolls through. Josh now has a leg cramp. Robbie sets up for the super kick, but Josh gets in his way. Adam comes up from behind and locks him in the sleeper hold, and Robbie passes out. WINNER and STILL OVW TV CHAMPION: REVOLVER by submission. Backstage, Shiloh Jonze is talking to the Bodyguy. Bodyguy says his problem was being around a bunch of doofs like Nick Dumeyer & Raul LaMotta. Bodyguy had to teach Big Jon how not to be such a doof and they are tag team champions. Shiloh leaves and runs into Raul, who is on the phone. They argue, and Shiloh thinks Raul thinks he is better than him. Shiloh challenges him to a match. Shiloh Jonze vs. "Rudo" Raul LaMotta. Shiloh & Raul continuously try to outcheat one another. They rolls each other up with handfuls of tights. They fight to the outside where they chop each other. Inside, Raul takes off the turnbuckle cover while Shiloh grabs a chair. Jordan takes the chair and throws it outside as Shiloh takes a chain out of his boot. Raul catches a punch and they play tug of war with the chain. Jordan takes it away, but while his back is turned, Raul low blows Shiloh and rolls him up for the 3. We see a video from earlier in the day with Randy Terrez talking in Spanish to the Mexicutioner. We then see Melvin Maximus & Rump Thump wishing each other luck in the Fatal 4 Way, but both saying they were going to win. "The Psychadelic Superstar" Chris Silvio comes out with Mary Jane and they join Dean & Gilbert on commentary. Jason "the Man" Lee vs. Jamin Olivencia. Jamin comes out firing away and really taking it to Lee, but Jamin crashes off the top rope and outside to the floor after Lee hits the ropes. Lee hits Jamin on the outside and works him over for a bit, but Jamin fights back and finishes Lee off after hitting the jumping clothesline and Standing O for the 3. Gilbert Corsey brings out Flash Flanagan. Gilbert says we haven't seen Flash since the June Saturday Night Special and Flash was taking time to think about his future. Flash says he has been doing a lot of thinking. He has been wrestling for 22 years and he has to take a step back and think if it was all worth it. He has busted his tail to put on a show for all of us fans. He gets interrupted by Josh Ashcraft. Josh says that the show needs to go on and old washed up has-beens need to leave the ring and sail off into the sunset. Flash says before he got interrupted, he was going to say that he is not done yet and has nothing to lose right now. He starts going after Josh, but is saved by Marcus Anthony & Michael Titus. Titus says that Flash can prove if he still has it or not next week, by going up against the monster, Marcus Anthony. Flash says he's all fired up now and accepts. 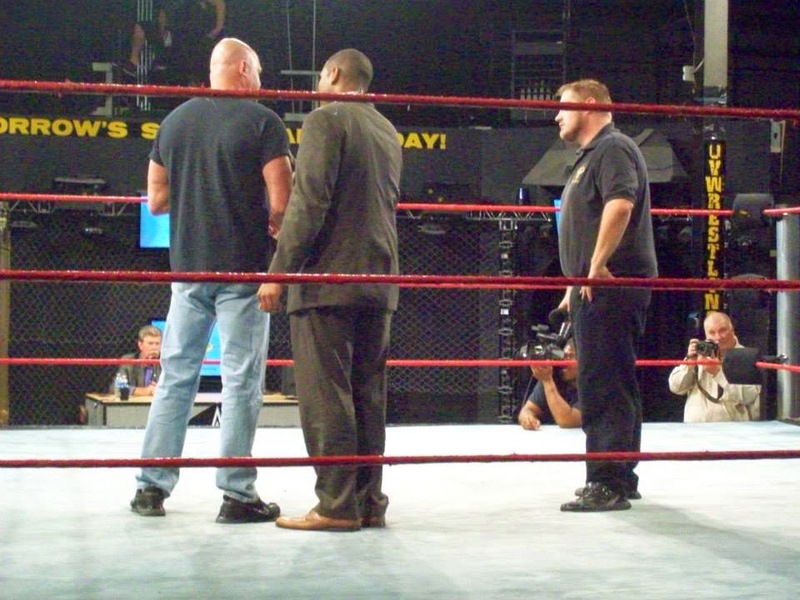 Backstage, Michael Hayes is arguing with Josh Ashcraft about becoming #1 contender. Josh says he is the senior official, but Jordan Barker peeks his head in the door and alerts Josh that he just came from Danny Davis' office and was appointed to be the referee for the main event. Hayes laughs at Josh. FATAL 4 WAY to determine #1 CONTENDER to the OVW HEAVYWEIGHT CHAMPIONSHIP: The Bodyguy vs. Rump Thump vs. "Mister Marvelous" Melvin Maximus vs. Michael Hayes. Bodyguy tries talking Melvin into working together, but Bodyguy gets hit by all 3 opponents and knocked from the ring. A lot of back and forth between all 4 men. Rump & Melvin are out on the floor and Bodyguy turns into a facebuster from Hayes. Josh Ashcraft runs out to distract Jordan from making the pin. Adam Revolver runs out and clocks Hayes from behind with the TV title. Bodyguy tries to pin Hayes, but Hayes kicks out at 2. Bodyguy hits a pedigree on Hayes, but Melvin pulls Bodyguy off the pin at 2. Melvin throws Bodyguy hard into the corner and delivers a back body drop. He catches Bodyguy in the Bearhug and Bodyguy taps. Josh tries to keep Jordan from calling for the bell, but he does. WINNER and NEW #1 CONTENDER: MELVIN by submission. After the match, Michael Titus & Marcus Anthony come out and have a stare down with Melvin. Jessie Belle vs. TNA Knockout Rebel. Jessie Belle attacks Rebel during her entrance. She clotheslines her, hits her in the corner, chokes her, and then chokes her with her boot in the corner. Rebel tries to elbow out, but Jessie knees her. Jessie throws her into the corner and runs into a boot from Rebel. Rebel fires back and hits a reverse Russian leg sweep, but Jessie rolls to the ropes. Jessie fires back and hits a Russian leg sweep for 2. Jessie goes to grab Rebel, but Rebel rolls her up in a small package for 3. After the match, Jessie Belle kicks Rebel, but Mary Elizabeth Monroe runs out and chases Jessie away. 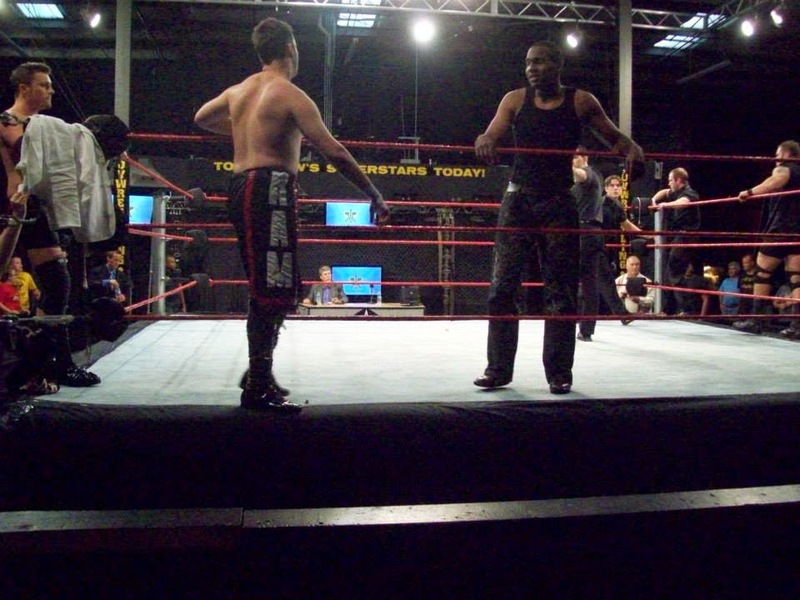 OVW Heavyweight Champion Marcus Anthony (w/Michael Titus) vs. Eddie F. Diamond. Marcus dominates most of the match with his power. EFD tries to chop, slap, and punch his way back, but Marcus uppercuts him. Marcus locks him in the Crimson Omen and this one's over. Next week, it's OVW Heavyweight Champion Marcus Anthony vs. Flash Flanagan! This episode of OVW TV will be up online tomorrow. As always, thanks for reading!